The $5 billion fund between Goldman Sachs and the Chinese Investment Corporation, named China-US Cooperation Partnership, is part of the $250 billion in business deals that President Donald Trump announced during his visit in China on the 8th of November in order to pursue a more balanced trade gap between the two countries (Exhibit 1). It will be a new Private Equity fund that will target companies in the manufacturing, industrial, consumer and healthcare industries. The investment strategy that Goldman Sachs will pursue is based on investing in firms that already have a presence in the Chinese market or have a potential to enter it and accommodate the increasing demand for innovative consumer products. The CEO of Goldman Sachs, Lloyd Blankfein, has defined this joint investment opportunity as a win-win game both for China to continue in opening up its economy, and for the US industrial sector to narrow the US-Chinese trade imbalance. Goldman Sachs is already present in the Asia-Pacific region, being the first foreign investment bank with a 5% market share in M&A transactions. This opportunity comes to the Chinese Investment Corporation in a moment of great difficulty in acquiring target businesses in countries where protectionist tendencies are blocking several deal opportunities. Even though the CIC has been founded as a sovereign fund investing in financial assets, they are boosting investments in private equity, real estate and hedge funds to diversify the portfolio and try to reach abnormal returns in the long-term. During 2017, CIC have made the biggest private equity real estate deal by acquiring the warehouse giant Logicor from Blackstone for $13.7 Billion. CIC is casting an eager eye at U.S. high-tech manufacturing, highways, rail lines and other long-term projects. In return, CIC officials have also said the fund can serve as a stable source of capital for U.S. projects. At the same time, CIC failed to acquire strategic stakes in American technological companies, such as Lattice Semiconductor, a deal which was blocked by president Donald Trump for security reasons. This kind of bilateral agreements could enhance the opportunity for Chinese investors to reduce barriers, maintain productive assets in key countries and assure a fair deal for both economies. 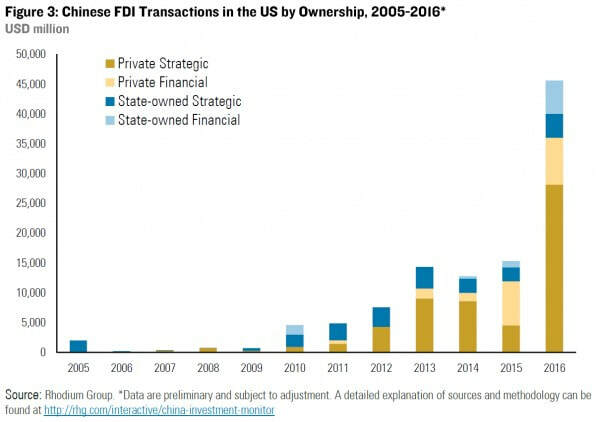 The Investment fund actions will be kept under control from the US and Chinese businesses not due to the hypothetical sum of money channeled through it, but especially because it is a new way through which Chinese businesses could try to acquire profitable American companies (Exhibit 2) and the US to enter the Chinese market. This innovative way of channeling private equity investment through a major US bank, with precise boundaries from the government, could hit the ground for reaching a more relaxed cross-border transactions environment, without regulators promptly blocking sensible deals. There are two main facts sustaining the importance of this cooperative fund. The first one is that Goldman Sachs and CIC will host jointly a business summit in the first half of 2018 that will involve business leaders, policy makers and investors from China and the US. The second argument, related to financial regulations, is the 49% cap that Chinese corporations must respect when partnering with foreign banks. Goldman has already discussed with local regulators but, nonetheless, it will be a topic of discussion since, if the fund works successfully, it could pose threats to Chinese state banks.